It seems like the term "Innovation" is tossed around everywhere in education. As much as many educators may roll their eyes at the word, the indent is usually good. With some many advancements in technology and the rate of change that now defines our world, we would be foolish not think that education should play a part in this "Innovation Revolution". The possibilities of what we can do now in education is much greater than when I started 20 years ago. For those who have tried to innovate within their classroom, their school, their curriculum, etc., there are positive success stories mixed in with some not so successful ones. Innovation is never perfect and is often quite messy. This is part of the downside to innovation. Over the past three years, I had the opportunity to be a part of this "Innovation Revolution" as a district STEM Coordinator. From mobile STEM labs, to makerspaces, to tiny houses, I had a front row seat for the good and the bad that comes along with innovation. From these experiences, I saw a downside to innovation that I never really gave much thought to beforehand. The biggest downside to innovation is the realization that success can be limited by the readiness of others. Frankly, this is the most frustrating part of the whole thing. 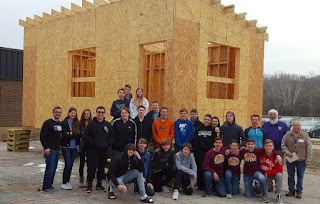 Last year, we took a giant leap to offer a class called Geometry in Construction. The ideas behind this class were not really that innovative. You create an interdisciplinary course by combining a traditional geometry course with a construction course. However, this class screamed innovation for us since we really did not have a pure interdisciplinary course at our high schools like this. It screamed innovation because we had previously not offered a construction class. We have more traditional wood and metal shop courses but nothing like this. And perhaps the most innovative thing we did was choosing to build a tiny house. All of us were new to this and thank goodness for our awesome teachers who made this class work...and work well. The took on the challenge of innovation and knocked it out of the park. 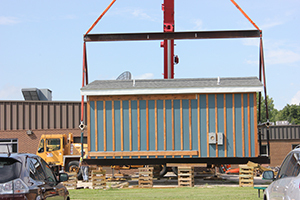 Recently, our tiny homes were picked up from our schools and transported to their new location. Seeing them loaded and driven away added some closure to the course but also caused me to reflect on where we had been and what we were doing next. You see, our partnership was only for one year and we would need to find a new project...and this is where the downside to innovation really hit me hard. Parts of my community was not fully ready for what we were doing. Surprising to me, we could not find a partner to do another house build. We reached out to your typical organizations, did a media campaign, reached out to different community entities but we came up empty for a big project. I am thankful to some of our smaller community partners that we are using this year. They saw our value and we super thankful for them. However, when you built a 340 sq ft house last year at two schools, there is really no going back from that. To this day, I am surprised that we could not find a partner who would let us build for them. We were breaking the mold of who could provide housing solutions in St. Louis. Our freshman and sophomores are ready to learn, showcase their skills, and give back to community. So in the spirit of innovation, we are going to tackle a project on our own that we have never done before...we are building a mobile tiny home! And again, we will go through the roller coaster of innovation...learning, failing, learning, failing...and in the end, we will produce a home that will be used to benefit our community (still working out those details). The downside of innovation had me discouraged for quite some time. Now, I have cast that aside and a new hope guides me. I have no clue what lies ahead for us. It could be complete success, complete failure, or something in between. Either way, we will push forward to innovate again. Hopefully, we will show our community what we can do and how valuable we can be to an organization. And maybe then, others in our community will be ready to embrace our innovative idea and let us be a solution to our regional affordable housing program. The Hour of Code is here again and this excites many of our students and educators. Code.org, as always, has a great variety of activities for the beginning coder and the more experienced ones. The Hour of Code is a time to celebrate what is great about computer science, expose many to CS for the first time, and look towards how CS can be expanded in education. Unfortunately, the Hour of Code also brings out that person...you know, the one who is critical about anything "special". - An hour of code is not enough and does not make up for a lack of computer science opportunities. - What about an hour of ________________ (fill in the blank with just about anything)? - What are students really learning in the Hour of Code? - Playing "games" with code is not "real" coding. - We need to be going beyond the Hour of Code. I would actually agree with most of the statements above. It is true that one hour does not constitute robust opportunities to engage in computer science. There is a ton we can do to go beyond the Hour of Code. Yes, there are other areas that deserve recognition too. In education, when we call out something special (ex. - STEM, STEAM, etc. ), there is this knee jerk reaction to say what about (insert subject area here). Just because we are highlighting one area, does not mean we are saying others are less worthy. Education should not be a turf war...there should be room for everyone. So this year, before we jump to criticize the Hour of Code just because it's popular (and sadly this happens far to much in our social media spaces)...let's think about this. 1. The Hour of Code could be a student and/or teacher's first expose to computer science...let's celebrate that. 2. The Hour of Code could be the catalyst to convince school administration that computer science needs to be a part of every students K-12 experience...let's celebrate that. 3. The Hour of Code provides the opportunity for all students to experience computer science, not just the stereotypical CS students...let's celebrate that. 4. The Hour of Code makes computer science accessible to educators with no CS background and perhaps this leads to new learning opportunities for their students...let's celebrate that. If you are new to the Hour of Code, I hope you have a great first experience. For those of us for whom the Hour of Code is not our first CS rodeo, let's help those going on their first ride. Encourage others and share how you utilize CS in your classroom. Take this opportunity to publicize the great CS activities that you bring to your students. And for that person, the one who is bound to criticize the Hour of Code and those who participate in it, I hope the above thoughts will give you some pause and new thoughts to ponder. My plea to you...don't be that person this year. It has been quite a while since I have used this blog. However, I am resolving to change that pattern after being inspired by a few colleagues at work today. As they asked me about my blog, I really reflected on the fact that it has been idle for too long. Blogging is a great way to process thoughts and share ideas for others to critique, celebrate, etc. With all that being said, this post is a new beginning. Writing has always come in spurts for me and maybe this is the start of another one. Regardless, thank you Stacey and Kristen for talking to me about my blog and for giving me the spark to start it up again. Today is an exciting day coupled with sadness. Today is a day filled with nervous energy but also nervous fear. Today is a day that marks the end of one chapter and the beginning of another. Today is my first day of a new job, Coordinator of STEM K-12 for the Rockwood School District. My thoughts today are really all over the place. I have had several weeks to contemplate this, analyze it, begin working to succeed at it, and to think back on what I had been and what I was now becoming. For 8 years, I was an Instructional Technology Specialist and this job defined me. During that time, I presented at conferences, helped way more teachers than I ever thought possible, worked with awesomely enthusiastic students, and really felt like I made a difference. In the last two years, I was blessed with many opportunities...none bigger than attending the Google Teacher Academy. This opened up even more opportunities and I feel it was one of the reasons I was accepted to present at ISTE 2015. Presenting at ISTE was a bucket list moment for my career...the third try was the charm. My presentation could not have been better! I had a full room, an engaged audience who participated fully, and at several points of the day, I received compliments from participants as I walked around at the conference. It was a success and I was on top of the world. My success at this job defined me. Over the years I received numerous awards, received positive feedback from teachers, administrators...even a group of 6th graders defined me as "cool"...the ultimate compliment from a 6th grader. In the online spaces, I have built a reputation on my work and this is something I am really proud of and hope to continue. Within my local community, I have been sought out by a number of districts and schools to provide PD. My success has defined me. I am not being boastful, I don't think I am the end all be all of edtech, but I do acknowledge that success has been there. This success is what makes me sad and nervous. I am leaving this behind. One of my most successful moments as an Instructional Technology Specialist is most likely my last. Leaving on this note puts doubts in your head about whether I made the right decision, whether I will be able to be as successful, and whether I will be able to redefine myself. That process starts today! I have a new identity now...and I think it will be a split identity. My past is something that is not being deleted. It is still part of me but now my identity has shifted. I now need to start building my STEM identity and that is exciting. We have many exciting things planned this year and there will be many challenges ahead. This is going to be a year of change and I anticipate that I will work harder than ever. So why am I doing this? It is all about the possibilities and the impact we can have on students. Just like technology, the world of STEM is constantly evolving with new possibilities and challenges. It is my hope that all I have learned over the past 16 years in education will help me serve the district as their STEM Coordinator. For now, I can mourn the passing of one job and embrace the excitement of the new one. I have to admit...writing this was selfish and has helped me process everything. Hopefully, you can glean some thoughts that can help you. I look forward to blogging about the successes of the future.